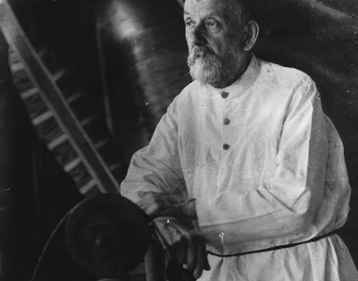 Konstantin Tsiolkovsky is known as the "father of rocketry.'' He was an extraordinary Russian who lived from 1857 to 1935. He was born deaf and therefore was not able to attend elementary school. Nevertheless, he managed to teach himself physics and mathematics from books, and at such a high level that his father sent him to Moscow to study further. Sadly, because of his hearing limitations, he ended up spending most of his time in the great Moscow libraries instead of at the university. However, just as he had done before, he educated himself in the library, and managed to get a job as a mathematics teacher in the town of Kaloega in 1882. Even as a child, Tsiolkovsky had been fascinated by rockets and their possibilities for the exploration of space. He understood that rockets are ideally suited for space transportation because they work according to Newton's principle of action equals reaction; in reaction to the expulsion of fast gas through its nozzle, a rocket is thrust forward in the opposite direction. This is similar to what happens when a person shoots a gun and his arm is pushed back as a reaction to the lightweight but very fast bullet leaving the barrel. Unlike conventional internal combustion engines or even jet engines, rockets carry their own oxygen, so they do not depend on any outside air. Rockets do not need an atmosphere to fly through and can thus operate in the vacuum of space. Tsiolkovsky studied the physics of rocket propulsion and formulated the famous Tsiolkovsky equation (or rocket equation) that describes how a rocket's velocity changes in relation to the efficiency of its engine and the amount of propellant it carries. The more propellant that is consumed and the higher the velocity at which it is expelled through the nozzle, the greater the increase in a rocket's velocity. In the process of consuming propellant, the rocket becomes lighter while the engine's thrust remains the same. Its acceleration therefore increases continuously, resulting in a nonlinear relationship between the rocket's velocity and the thrust duration. Tsiolkovsky's equation, which describes all of this in an elegant way, is the basis of all calculations regarding rocket propellant consumption and velocity. In addition to rockets, Tsiolkovsky also studied and wrote about steerable airships, manned rockets, self-sustaining space stations, and spacesuits. This was something quite remarkable and even eccentric in a time before airplanes. Tsiolkovsky never built any rockets himself, but he inspired a number of young Russian rocket experimenters who in the 1930s began to build small experimental rockets (Fig. 3.1). What is less known about Tsiolkovksy is that even while he was laying the theoretical basis for space transportation rockets half a century before such machines were made a reality, he was already contemplating the technology that might replace them: space elevators. Tsiolkovsky visited the just-completed Eiffel Tower in Paris and started to wonder what it would take to build an elevator reaching all the way into space. In 1895 he published a book, Dreams of Earth and Sky, in which he described a giant tower extending out of the atmosphere all the way up to geostationary orbit at a height of 36,000 km (22,000 miles). On the top, at the end of a spindle-shaped cable, he envisioned a "celestial castle'' (what we would now call a space station) that could be reached by an elevator. Tsiolkovsky named his system a ""beanstalk,'' after the giant plant from the fairy tale "Jack and the Beanstalk.'' This was the first time anybody ever contemplated the concept of the space elevator, more than 110 years ago. Tsiolkovsky correctly reasoned that the apparent gravity a person would feel on the way up into space would diminish, both because of the increasing distance to Earth as well as due to the increasing centrifugal force. He wrote, "As one went up such a tower, gravity would decrease steadily, without changing direction; at a distance of 36,000 km, it would be completely annihilated, and then it would be again detected . . . but its direction would be reversed, so that a person would have his head turned towards the earth.'' In the process, Tsiolkovsky thus discovered what we now call the geostationary altitude, the point up the tower at which the gravitational and centrifugal forces are in balance. Figure 3.1: Konstantin Tsiolkovsky, the "father of rocketry." Building such an unbelievably high, free-standing tower would be extremely difficult. In early 1962 the Convair Division of General Dynamics carried out a feasibility study on very high towers, for possible use in astronomy, high-altitude research, and communications, and for launching rockets above the dense part of the atmosphere. The researchers theorized that towers can be built up to an altitude of about 6 kilometers (4 miles) using steel, and up to an altitude of 10 kilometers (6 miles) if aluminum is used. That is comparable to the height of the tallest mountains, so there would be little point in trying to build such towers except that you could place them where they were needed. Nowadays there are novel construction materials, such as graphite composites, that could make much higher structures possible, but even these would be limited to several tens of kilometers in height. Enormous towers would need to have very wide bases, looking somewhat like elongated pyramids, to be able to support their own weight. They would thus be of huge size and very expensive. Most importantly, they would still not be able to reach into space. However, in I960 another Russian engineer, Yuri Artsutanov, suggested a much better idea in the Young Person's Sunday supplement of the Russian newspaper Pravda, under the intriguing title "Into Space with the Help of an Electric Locomotive.'' Rather than building a tower from the ground up, he proposed to start with a satellite in geostationary orbit. From there, a cable could be lowered down to the Earth's surface while at the same time another one with a countermass could be deployed in the opposite direction to compensate for the first cable's mass. He estimated that the total length of cable required would be between 50 million and 60 million km (30,000 to 40,000 miles). This would ensure that during construction and thereafter, the satellite would always remain at the stationary point. Although space travel was still very new and no cosmonaut had yet been put in orbit, Artsutanov correctly argued that in the future the construction of rockets was not going to change in principle and that these vehicles would always take huge amounts of propellant and effort to get into space. Moreover, he foresaw that in any rocket the passengers and cargo would be subjected to high acceleration loads. Artsutanov therefore considered a "cosmic cable way,'' with trains using electromagnetic fields gently climbing up, to be a much more elegant and efficient solution. After passing the equilibrium point (geostationary orbit), the trains would not even need to be powered as they would be driven on by the centrifugal force alone. At the top of the cable Artsutanov imagined an entire city with greenhouses, observatories, solar power stations, workshops, propellant depots, and docking areas for interplanetary rockets (in reality it would be much better to locate most of this infrastructure at the lower geostationary point, where everything would be weightless). He argued that the rockets docked to the cable would already have orbital speed and thus would be much easier to launch from there than from Earth; not requiring heavy structures and high thrust levels, they would be more like ocean liners than like conventional launch vehicles. Artsutanov also considered the danger of damage to the cable by meteor impact; he proposed using a series of parallel and interconnected threads instead of one single tether. However, although Artsutanov's concept does not require a tower reaching far into space, producing a cable over 50,000 km (31,000 miles) long would not be an easy task either. Artsutanov already warned that the cable would need to be made from especially strong materials that did not yet exist in 1960 (or even in our time, for that matter). John McCarthy in the United States also had been thinking about a space elevator concept as early as the 1950s, but had dismissed the idea on the grounds that the cable required a tremendous tensile strength and such a material did not exist. As an alternative he invented the rotating Skyhook, a 10,000-km-long (6200-mile-long) rotating tether with its center of mass in a 5000 km (3100 mile) orbit. Each arm of the skyhook would thus touch down at the Earth's surface once every tether rotation, where a payload could be quickly attached to be flung into space. McCarthy can thus be considered to be the father of the momentum exchange tether. In 1966, a team of American engineers led by John Isaacs of the Scripps Institute of Oceanography (the others involved were Allyn Vine, Hugh Bradner, and George Bachus) determined what type of material would be required to build a space elevator, assuming it would be a simple, straight cable without any variations in its cross section. It turned out that the strength required would be about twice that of the strongest materials existing at that time, such as graphite, quartz, and diamond. However, the forces on a space elevator cable are not the same everywhere. The section of cable in geostationary orbit is in equilibrium, because its speed is just right so as not to fall back to Earth or to fly away; without the rest of the cable it would simply be in orbit as a satellite. The cable beyond it, going further into space, is effectively moving too fast for the altitude and tries to fly away. It is therefore pulling on the sections of cable below. The longer the piece of cable in the outward direction, the more mass is pulling and also the higher the difference in local orbital speed and cable velocity. Hence, looking back from the end of the tether, the closer to the geostationary point, the higher the loads on the cable. On the opposite side, the part going down from the geostationary point to Earth, there is a similar effect; in this case the cable is pulling down and trying to fall back to the surface. The tension force in the space elevator is thus highest at the geostationary point and diminishing in each direction. Figure 3.2: In the tapered space elevator concept, the thickness of the cable varies with the tension it needs to cope with (not drawn to scale). connections close to Earth and the countermass, but grows in thickness toward the geostationary point, where the cross section reaches a maximum (the optimum taper profile is not linear). The ratio between the thickest and thinnest part is called the taper ratio (Fig. 3.2). In theory, such a space elevator tether could be made of any material, but the less tension the cable material can handle, the higher the necessary taper ratio and thus the thicker the geostationary section. 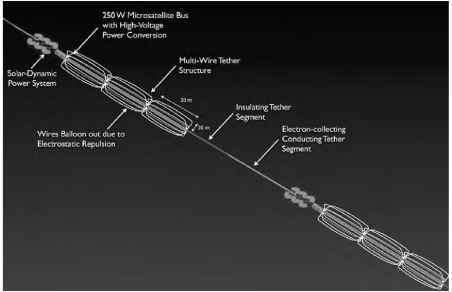 Using stainless steel and a cable diameter of only 10 centimeters (4 inches) on Earth, the tether would need to taper to a maximum thickness on the order of millions of millions of kilometers. However, with carbon nanotube materials currently under development, the taper ratio could be as low as 1 to 2—a maximum thickness only twice that of the minimum diameter. Similar to Artsutanov, Pearson suggested unrolling a 144,000-km-long (90,000-mile-long) cable with a countermass to compensate for the mass of the lower section of cable reaching to Earth. Pearson included in his calculations disturbances such as the gravitational attraction of the Moon, the force of the wind on the lower end of the cable, and elevators moving up and down. Pearson published his ideas in the international journal Acta Astronáutica, in which he described the use of the space elevator for launching payloads into space and to other planets without requiring rockets. He found that if all the mass of the needed material had to be brought from Earth, it would require no less than 24,000 Space Shuttle trips. However, part of the material could be transported up by small elevators riding a thin, minimum-strength tether lowered to the surface ahead of the real, heavier cable. In the following decades the space elevator concept was developed further by a growing number of people. A strong sign that the idea was starting to be taken seriously was a workshop on space elevators organized by NASA's Marshall Space Flight Center in Huntsville, Alabama, in 1999, the results of which were published in 2000 in a report, "Space Elevators, an Advanced EarthSpace Infrastructure for the New Millennium"
In the meantime also other space tether applications were contemplated. In 1973 Mario Grossi of the Smithsonian Astrophysical Observatory suggested deploying a long wire from the Space Shuttle (a vehicle then still under development) to act as an antenna for extremely low frequency radio waves. This led in 1974 to the idea of Giuseppe Colombo of the Padua University in Italy to have the Shuttle "troll" a small satellite on the end of a long tether through the atmosphere. Colombo foresaw that this experiment could be used to study plasma physics and electricity generation in the upper atmosphere. The ideas of Grossi and Colombo led to the Tether Satellite System (TSS) that later flew on the Space Shuttle (see Space Shuttle Experiments in Chapter 4).